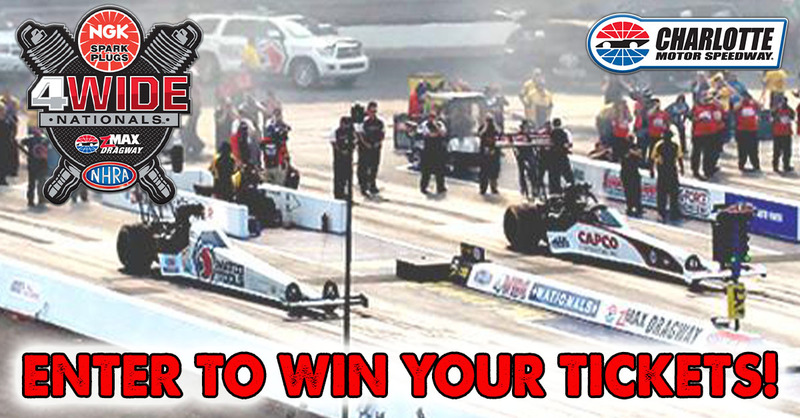 Use the form below and enter for your chance to win a 4-pack of tickets to the NGK Spark Plugs NHRA Four-Wide Nationals April 26th – April 28th at Charlotte Motor Speedway’s Z Max Dragway! In this exciting race, drivers break from the traditional side-by-side drag racing to run four cars at a time (side-by-side-by-side-by-side). Four nitro cars produce more than 44,000 total horsepower – that exceeds the entire 40-car field that will race in the Coca-Cola 600 NASCAR event in May. New for 2019, zMAX Dragway will host a Friday “Night of Fire” with qualifying sessions later in the evening. Cooler temperatures will mean faster race conditions, with cars producing 8-foot header flames as they barrel down the track at more than 330mph. Also new this year, fans can enjoy drifting ride-alongs with professional drivers from E10 Drift. Every NHRA ticket is a pit pass, giving fans the ultimate access to their favorite drivers and see the crews tear down the cars between each run. To purchase tickets or for additional information, visit CharlotteMotorSpeedway.com.